A train slices through the Los Angeles night, briefly illuminating its pitch-black emptiness. Aboard is a man who’s sustained a long-term criminal career by operating in a state of impermanence, ready to leave everything behind at the drop of a dime if need be. So opens Heat, Michael Mann’s sprawling 1995 crime epic which meticulously probes the City of Angels’ embedded ugliness like a seasoned detective. Between the heists and ensuing dragnet, Mann explores his characters&apos; motives and minutiae, revealing that sometimes the only difference between cops and robbers is the side of the invisible line they’ve chosen to stand on. Ignored by the Academy, Heat’s impact has been felt through influence. Its stark cinematography, the striking realism of its action sequences, and intricate character analysis have left a lasting imprint on the genre. Crime is often more complex than good and bad or cops and robbers, a sentiment Heat echoed louder than gunfire in a confined space. With ‘95 came the moment film nerds spent two decades salivating at the thought of. After Robert De Niro and Al Pacino occupied the same cinematic universe in The Godfather Part II (and before they were old guys fighting in slow-motion in Righteous Kill), Heat pitted them against each other. Pacino plays LAPD Lt. Vincent Hanna, the hunter; as Neil McCauley, De Niro becomes the hunted after he and his team of misfits rob an armored truck carrying $1.6 million in bearer bonds. Mann created two men who, despite being divided by legal allegiance, are essentially the same person. The obsessive tenacity that makes Hanna a great cop also has him nearing strike three on his third marriage. McCauley, his tactical and intellectual match, has subscribed to a life free of attachment. As they discover during their face-off at the now-closed Kate Mantilini, they’re both consumed by professions that prevent them from functioning like normal people. Although McCauley recites street philosophy about always being prepared to flee when the pressure’s on like it’s a commandment, there’s a longing for connection beneath his callous exterior. During the "family dinner" scene with his crew, he realizes that he’s the only one who’s alone. He immediately calls Eady (Amy Brenneman), to whom he previously insisted that he’s "alone, but not lonely," and attempts to build a legitimate relationship—something that exposes him to professional vulnerability—with her. He also goes out of his way to stabilize the volatile marriage between his underboss, Chris Shiherlis (Val Kilmer) and his wife, Charlene (Ashley Judd). Granted McCauley needs Shiherlis’ head in the game to execute their final job, his actions show a desire to prevent the younger man from detonating the nuclear family situation he doesn’t envision for himself. Prying into his subjects’ personal lives allowed Mann to bleed their seemingly black and white worlds into a realistic gray area. This in-between space has been explored by subsequent crime-focused projects. At the core of True Detective, long winded diatribes aside, are cops with fractured lives. Its first season slowly unveils all the ways that Rust Cohle is damaged, his internal fissure deepening as the story progresses. He shares Hanna’s addiction to work, while philandering partner Marty Hart’s marriage similarly transitions from on the fringe to non-existent. Real people exist behind the badges, and real people occasionally struggle. This theme was bolded and underlined during the second season, where there were more officers (three, to be exact) with more problems (substance abuse was a big one, but fucked up families were the common denominator) and more parallels. The bar scenes between troubled cop Ray Velcoro and struggling crime boss Frank Semyon harken back to the restaurant exchange between Hanna and McCauley, with the same layer of tension looming above the pleasantries. The strongest—and most obvious—indicator of Heat’s effect is the takedown-turned-shootout at the midpoint of True Detective’s second season. Similar to Heat’s bank heist gone awry, the deafening volume of the weapons and lengthy duration of the scene (both seemingly last forever, as the moment would feel to someone present) enhance its authenticity. As casualties mount on both sides, both scenes become more tragic when pedestrians get caught in the crossfire. The Vinci Massacre owes a creative debt to Heat, which was steeped in reality. 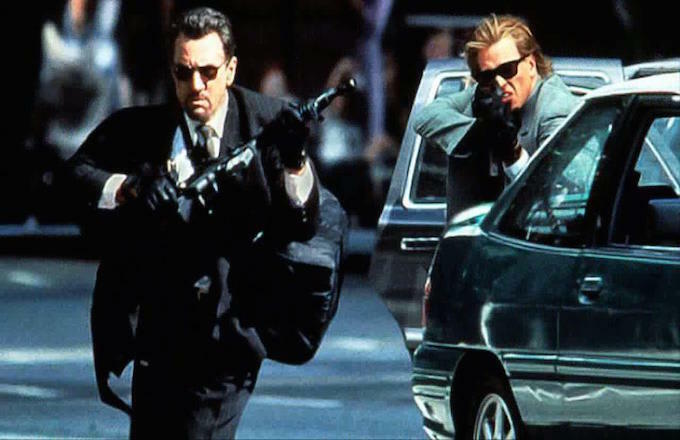 During a 20th anniversary screening of the film at the Toronto International Film Festival in September, Mann explained that De Niro, Kilmer, and Tom Sizemore actually diagramed a practice bank robbery and the actors used live ammunition when training for their roles. However, traces of Heat’s shootout are found in a real-life incident that took place a few years afterwards. On the final day of February 1997, the LAPD engaged in a harrowing 44-minute gun battle with Emil Matasareanu and Larry Phillips—both armed like they were ready for war—after the pair knocked over a Bank of America in North Hollywood. Spilling over into a residential neighborhood, the conflict ended with the deaths of Matasareanu and Phillips, injuries to 18 others (11 police officers and seven civilians), and the combined usage of nearly 1,800 rounds of ammo. To the cinephile, the sheer mention of bank robbers with high-powered weapons airing it out with police in broad daylight inspires immediate thoughts of Heat. But just as this IRL moment can be linked to the film that preceded it, there are touches of Heat in another about crime in the big city. Christopher Nolan’s Batman trilogy stands out because he brought as much minimalist practicality as one director can to the superhero realm. His Batman didn’t have to wear a suit; he could’ve been a CIA operative and the film would’ve had the same feel. Batman’s objective, similar to any other member of law enforcement, was cleaning up the underworld—he was just a little crazy and had the best resources at his disposal. In overt and subtle ways, portions of The Dark Knight are nods to Heat. The bank robbery at the beginning of the former is reminiscent of Heat’s early armored truck heist and infamous bank job. Although the masks used in The Dark Knight have more character than the hockey masks seen in Heat, the tone of the scene is more Heat than Point Break. Nolan has admitted to drawing inspiration for The Dark Knight from Heat, all the way down to William Fichtner’s casting. "In the case of The Dark Knight, we&apos;re attempting to tell a very large, city story or the story of a city," he told IGN in 2007. "In the same way that, I don&apos;t know, Michael Mann&apos;s films, like Heat or something." Watching Batman look down upon Gotham from lofty heights evokes images of McCauley and Hanna doing the same in Heat, surveying L.A. and the millions of stories the city holds. This is similar to those foreboding aerial shots from True Detective’s second season meant to illustrate the story’s connectedness. It’s a touch Mann honed years before, when his mastery was nearing its pinnacle. Prior to his Audioslave addiction, Michael Mann was the king of crime noir. Long before Colin Farrell resurrected his Miami Vice mustache for True Detective, Mann served as executive producer for the original Miami Vice. He’s the first person to bring Hannibal Lecter to the big screen (1986’s Manhunter) and left his fingerprints on Crime Story and L.A. Takedown afterwards. Heat is loosely based on real people, and Mann spent time shadowing police, talking to Folsom State Prison inmates, and putting his cast through rigorous training to make the film feel as realistic as possible because this is his territory. Part of Heat’s legend is that it arrived at the right time. It featured Pacino just before his regularly scheduled screaming through scenes reached self-parody, and De Niro as his subtle-yet-vicious equivalent in the years leading up to his meddling or flat-out dirty grandpa phase. Heat explores what’s behind the veil of good and bad, a reminder that criminals walk and live among us and that those who uphold the law are similarly flawed. 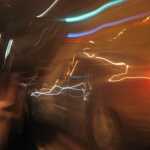 The resonant fusion of character study and action is merely its cup of brilliance running over. Heat’s status as Michael Mann’s best film is arguable, but there’s no debating that it’s his most memorable. It’s clear that other auteurs have taken notice as well.